Nearly everybody who bought school supplies in the ’80s and ’90s has been blinded with the searingly bright designs of Lisa Frank: Trapper Keeper and folder designs, stickers, even jewelry. 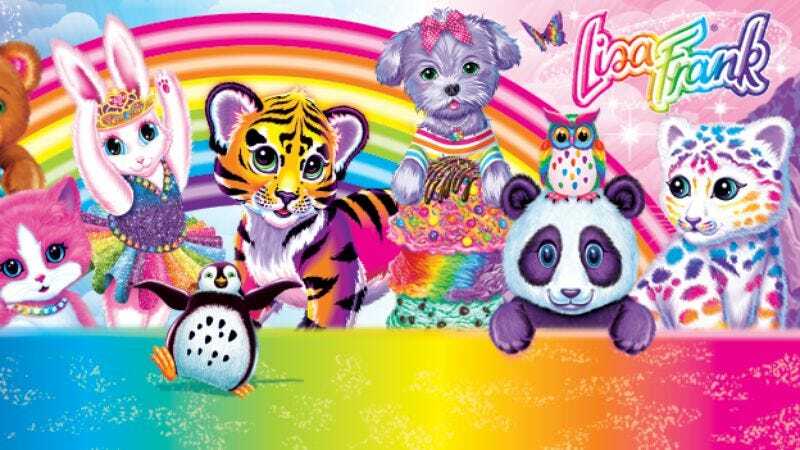 Lisa Frank designs are instantly recognizable by the big-eyed characters, bright rainbow colors, and surfeit of unicorns and pandas. So it might surprise fans (and former fans) that Frank was heavily influenced by abstract modernism and pop art—names like Josef Albers, Jasper Johns, and Jean Arp. Frank learned to marry her own work with commercial interests, and soon the Lisa Frank aesthetic was born. Frank is notoriously reclusive, but Carly Mark of Foundations magazine spoke with her about how the business got started, Frank’s surprising influences (Jasper Johns, among others), and pioneering rainbow leopard underwear. I’ve always been ahead of the game. I was making leopard underwear thirty years ago. Literally rainbow leopard underwear. People thought I was a kook. It didn’t sell! It was so new. When we started this business everything made for a consumer was solid colors. The whole interview is worth a read for recovering Lisa Frank sticker collectors. You can read it at Foundations.